One of our most popular articles is a comparison on air purifier and humidifier combo machines. With good reason, people love to save time, money and space. As we pointed out in that article, you can save a few bucks and get more performance from a standalone purifier and a humidifier. Some shoppers took our advice while others cast it aside and opted for the form factor of an all-in-one option. But, when Dreval axed the popular D-850 we reviewed they introduced a purifier that proved our point; the Dreval D-903. The 903 is a standard air purifier… one without the D-850’s humidification feature. We think it’s a solid choice if you’re shopping for a purifier without humidification. However, they did create an affordable D-850 replacement (Humidifier and Purifier in one). So, if you still think you can outperform two separate appliances for less money… this Dreval D-950 review is for you. The Dreval D-850 is so 2017… and older. This year Dreval introduced two new and improved models; the 950 and the 903. The 950 is slightly better than the 850, and we’re going to tell you why. Like the 850, the 950 has a seven stage filtration process. The 950 still has it’s sibling’s cold catalyst and activated carbon stages welcoming dry, smelly, and dirty air into the purifier humidifier combo unit. It also has the same anti-bacterial third stage as the 850. 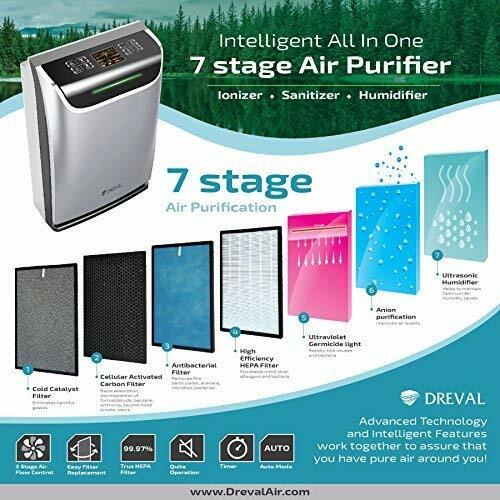 The next stage, common to all Dreval’s is a pretty good HEPA filter that removes 99.97% of particles measuring .01 microns or larger. The 950 also offers the same UV Lamp, Negative Ion Generator, and Ultrasonic Humidifier. And, the replacement filters are also the same. That is helpful if you already own an 850… but would like to add another unit to your home. Similarities provided by the 950 extend beyond the filtration system to other areas. The most notable is that it also covers 430 square feet of interior living space. Exterior dimensions are also similar enough to warrant a spot in the “similarities” section. Though the 950 is marginally smaller than the 850. The least notable difference is that the 950 weighs .2 pounds more than the 850 it replaces. The weight gain is likely the result of the much better looking housing. The first big upgrade in the 950 is the smart sensor. It now controls the fan, humidifier, and ion generator automatically. The model it replaces offered a smart sensor. But, it only controlled the fan speed when it noticed a change in air quality. Not the other stages of filtration. Another change is that the 950 now carries an AHAM CADR of 220 cubic meters per hour. The 850 was one of the few humidifier purifier combos that wasn’t verified by AHAM. That’s not necessarily a huge performance improvement over the 850, but it does give you a baseline to compare the 950 against other purifiers like the Sharp Plasmacluster. We also noticed that the 950’s fan has a greater range than the 850. The 950 will drop down to as low as 1.5 meters per second (m/s). Compare that to the older model which bottomed out at 2.5 m/s. The high fan setting is slightly lower than the 850’s 7.5 m/s. But, combined with the ultra low (i.e. ultra quiet) setting the 950 provides a greater range between its three fan settings. One of the biggest differences we noticed is that this unit is more efficient when it comes to electrical consumption. The total draw on the 850 was 85 watts. The 950 drops that to 45 for the purifier, and an additional 20 when the humidifier is running. That might sound like a small improvement, but over a year’s use the savings are significant. Especially where energy is expensive. This is a good purifier and humidifier… but like any product there are some quirks. First, the lights on the sensor indicator. If you’re in a dark room trying to sleep they’re pretty bright. And, the flash different colors as air quality changes. Kind of a cool feature in the living room… not so much if you’re a blackout shade kind of sleeper. Next… the location of the humidification exhaust is strange. It’s on the back of the machine. That means you must keep the unit at least 12″ from the wall. Speaking of the humidifier, the water vessel/canister is small. So if you’re in a really dry location this unit might not keep up with your needs. First, let’s go back to what we said in the beginning of this article. Nine times out of 10 you’ll be better off with two machines. A purifier for cleaning the air, and a humidifier for adding some moisture. A purifier with better performance will cost much less than this unit. For example, a Coway AP-1512HH is a way better purifier for a lot less money. Or you can get a really great purifier like an Austin Air, Air Mega, or Rabbit Air BioGS for about the same amount of money. You can then pick up a humidifier or two and you’ll have way more water capacity. But, if you’re still stuck on the idea of buying a humidifier purifier combo… this is a solid choice. It’s not the best choice, but it’s good. If it were our money to spend (only on a purifier humidifier combo), we’d get a Venta Airwasher. It doesn’t have a HEPA filter, but the reservoir is huge. And, it does a decent job of capturing larger pollutants. Bottom line… this purifier humidifier combo fits in just below a Sharp Plasmacluster. But, it will never beat a stand alone humidifier and purifier in any measurable way.